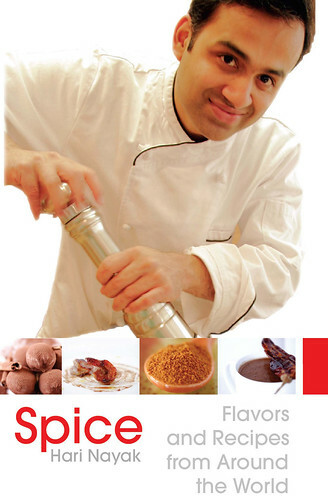 June 2008 marked the release of my new book “SPICE” . This book is a collection of easy to prepare contemporary recipes created for the modern living and entertaining. The recipes are simple, global very approachable to impress your guests. It has recipes for more than one hundred elegant, savory and sweet dishes such as Moroccan Lamb, Sole tamarind curry and squid with fragrant chili dressing. These creations reflect my Indian heritage, with plenty influences from my travels to Far East Asia, Middle East and south America. It is filled with fresh flavors, and practical advice, and this book is an illuminating guide to real entertaining for a modern cook. To make the spice paste, grind the lemon juice, ginger, garlic, chili powder, turmeric, and a little salt together to a fine paste, using a pestle and mortar or a small blender. Using a sharp knife, slash the sardines diagonally on both sides to allow the flavorings to permeate the flesh. Rub the spice paste all over, and set aside to marinate for 10 minutes. Heat the oil in a large frying pan. Cook the sardines in batches if necessary: Place in a single layer in the pan and fry over a low heat for about 2-3 minutes on each side until brown crisp. Serve hot with lime wedges.